Johnny is an actor, singer, and dancer who hails from Chicago, Illinois. He began his professional career at the age of ten in the role of Winthrop in The Music Man, directed by Gary Griffin, at the Marriott Theatre of Chicago. 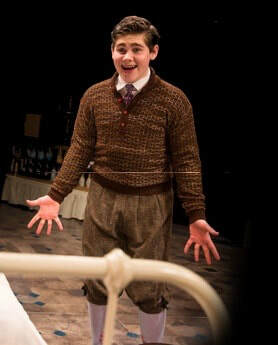 His next role was Young Danny in the Marriott Theatre's production of For the Boys, followed by Douglas in Provision Theatre's production of Shadowlands. In 2011, Johnny joined the 1st National Touring Company of A Christmas Story, The Musical, directed by John Rando. As a member of the ensemble, he toured five cities and concluded the tour at the famed Chicago Theatre. Just a few months later, Johnny auditioned for the Broadway production of the show and landed the leading role of Ralphie. He thoroughly enjoyed portraying the iconic character on Broadway's Lunt Fontanne stage as well as on The View and Good Morning America and at the 2013 Tony Awards ceremony. After his Broadway run, Johnny returned to Chicago to play Winthrop in the Paramount Theatre's production of The Music Man, directed by Rachel Rockwell, and to productions at Drury Lane Theatre and Provision Theatre. He then starred as Walter in the world premiere of Secondhand Lions, directed by Scott Schwartz, at the 5th Avenue Theatre in Seattle. Then it was back to Chicago to play Michael in Mary Poppins, directed by Gary Griffin at the Marriott Theatre. Johnny was soon off to NYC again to play the title role in the first two developmental workshops for Trevor, the Musical, directed by Marc Bruni. He then returned to Chicago to several shows and workshops and most recently played Arpad in the Marriott Theatre's production of She Loves Me, directed by Aaron Thielen. Johnny graduated this past May from The Chicago Academy for the Arts, where he was a member of the Musical Theatre department. He is grateful to all of his directors, teachers, and coaches who have helped him along the way and given him such wonderful opportunities. Johnny will be attending Stanford University this fall to double major in Theatre and International Relations and minor in Music. Johnny is represented by Stewart Talent in Chicago and by CESD in NYC.